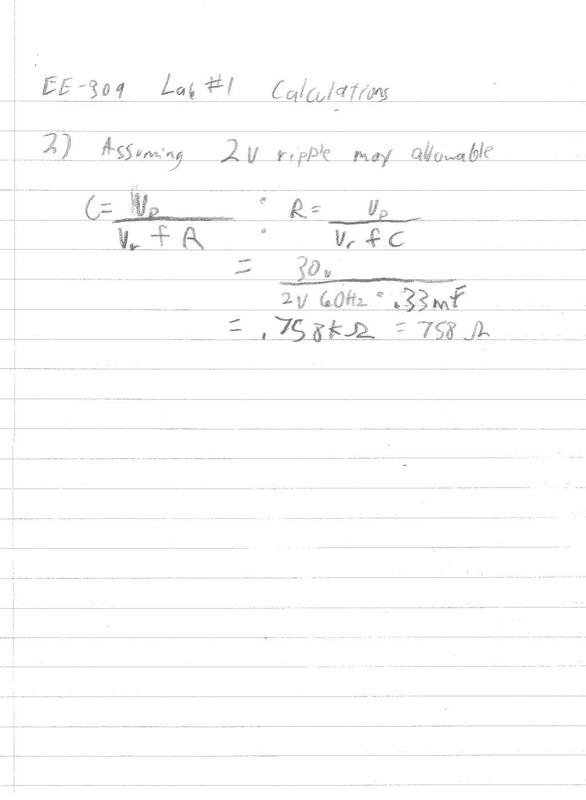 The objective of this lab is to perform routine calculations on a peak rectifier. 1)	PC with CircuitMaker® installed. 2)	Using a value of 20W for the load resistor, show the waveform at the output. 3)	Repeat step 3 using 200W and 2KW as the load resistor values. 4)	What load resistor values produce a reliable output? 5)	Add an additional 10W in series with the load resistor and repeat steps 2 - 4. 2)	Diagram 2:	Voltage - Time view using the 20W resistor. 3)	Diagram 3:	Voltage - Time view using the 200W resistor. 4)	Diagram 4:	Voltage - Time view using the 2KW resistor. 5)	Diagram 5:	Voltage - Time view using the 20W + 10W resistor. 6)	Diagram 6:	Voltage - Time view using the 200W + 10W resistor. 7)	Diagram 7:	Voltage - Time view using the 2KW + 10W resistor. 1)	Q:	What is the stability point of the circuit? 2)	Q:	According to the formula in the text, what minimum resistance should yield a viable result? This lab has demonstrated the basic operations of a simple full wave bridge, or peak rectifier. The results were good and were predictable. One note is that the data from the simulations predicts a stable operating point (<2V ripple) at around 1KW, which is expected form the calculations in question 2. I have performed this lab many times in a practical sense when I designed and built power supplies. With a 16W load using a LM317 driven by a power transformer rated at 3A @ 15VACRMS, I was able to achieve less than .1V ripple using 2 2200mF capacitors and a 1000mF on the output.